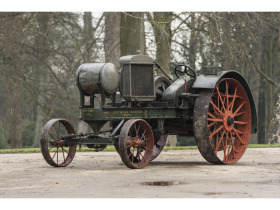 This 2 day auction is featuring Pre-1930 tractors, along with early engines and vehicles! Give us a call today to consign! 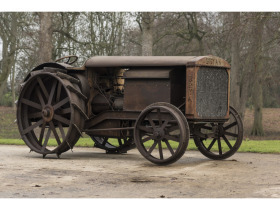 Do you have an Early tractor, engine or vehicle and are looking to sell? Now is your chance! 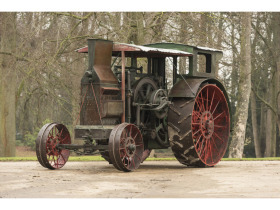 This 2-day auction features Pre-1930 tractors, along with early engines and vehicles! Call our office at (888) 282-8648 or email alex@aumannauctions.com to consign one item or your entire collection! Marshall Colonial - These tractors were built by Marshall, Sons and Co. specifically for export to English colonies. Tractors were shipped to Canada, South Africa, India, and Australian markets. This impressive example is a Model D that is powered by a vertical 2 cylinder gas engine. Although exact production numbers are unknown, they are low with very few remaining. International Harvester Mogul Junior - The Mogul Junior shares the same basic design as its larger counterpart- the 30-60 Mogul .  The Junior utilizes a single cylinder engine as opposed to two cylinder opposed engine. Of the 812 produced by International Harvester Company, there are few examples remaining. International Harvester 45hp Titan - International began production of the Type D Titan line in 1910 with three models including the 20, 25, and 45. Both the 20 and 25hp models were single cylinder engines but the 45hp utilized two cylinders arranged side by side that throw simultaneously. This example was built in 1912 before the 45s were re-rated at 30-60 tractors. 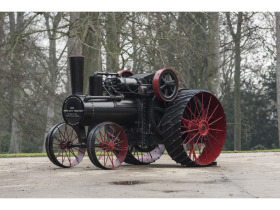 Rumely OilPull 30-60 E - The Model E was both the largest and the longest production tractor in the Rumely Oil Pull line. This example comes from a well known collection in Kansas. A set of 30-60 E rear wheel extensions will sell directly after this tractor! Fairbanks Morse 15-25 - Developed in 1910, the 15-25 was Fairbanks Morse’s answer to the growing demand for large distillate powered tractors. Like International Harvester Co. with their ‘Famous’ engine line, Fairbanks adapted one of their already successful 25hp NB engines to a tractor frame. Advance Rumely 18hp Traction Engine - Nice traction engine with a Universal boiler. Overtime (Waterloo Boy) - Overtime Tractor Company was a London based company that imported a large number of dissembled Waterloo Boy tractors. Once they were assembled in the UK, they were repainted and rebadged as “Overtime” tractors using the dark green, gray, and orange colors seen on this example. They offered both Model R and N tractors. The Bower City 12-25 - The “Bower City” tractor was Townsend Mfg company’s first production tractor. The name was changed multiple times throughout the years but the unique ‘steam engine style’ designed stayed the same. This example is in great mechanical condition and runs well. 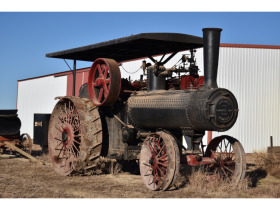 Bryan Steam Tractor - Bryan Harvester Company began offering these steam tractors in 1920. 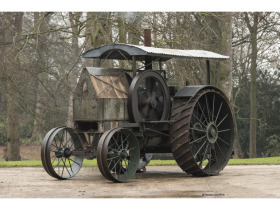 They were an attempt to keep steam in a market where farm tractors were beginning to get smaller. This example is in remarkable original condition and will be a show stopper everywhere it goes! Twin City 16-30 - In 1917, Twin City began selling the 16-30. It was vastly different from earlier models in that it was a very streamlined tractor with nearly all components enclosed. There were just over 1000 16-30s produced and only few examples remaining today. Minneapolis Universal Farm Motor - The Universal was Minneapolis Threshing Machine Co.’s first tractor outside of the steam market. It was sold under multiple names by various companies including the GasPull sold by Rumely. This example has been restored and is ready for the shows! 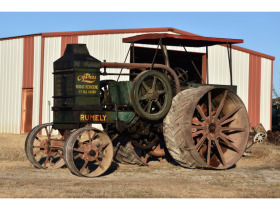 Rumely OilPull 14-28 - The 14-28 was Rumely’s first tractor to serve the ‘small’ tractor market. The overall design is identical to larger models such as the model F and E. This example is in nice original condition and still retains the majority of it’s original igniter ignition system. Bates 2 Cylinder Opposed Engine - Bates Tractor Company was formed in 1911 by a firm which included M.F. Bates. Bates initially offered two sizes, the 15 and 30hp, of which this is the later. It’s powered by a two cylinder opposed engine that supplied enough power to pull a 3 bottom plow. All-work 12-25 - Electric Wheel Company began offering tractors as early as 1908. By 1915, introduced the new “Light” Allwork model which was later updated from a 2 cylinder engine to a 4 cylinder engine. The 12-25 was initially rated as such but was later updated to a 14-28 within the first year. This example also features a front axle extension for used with plowing. Huber Crossmotor Light Four - The Light Four model was sold by Huber starting in 1916 and quickly became a popular model. It was offered by Huber until 1929. They are powered by a 4 cylinder Waukesha engine. Flour City 20-35 - Kinnard-Haines Company is considered to be on the earliest gas tractor producers with their first tractor being offered right at 1900. 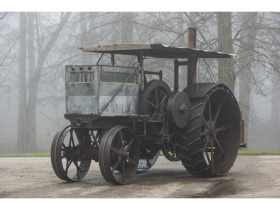 Like most of the earliest tractors, they were simply production engines that were adapted to a tractor chassis. Starting in 1911, three Flour City tractors were available with the 20-35 being the ‘mid-size’. As with their earliest tractor, Kinard-Haines produced their own engines throughout their Flour city line. 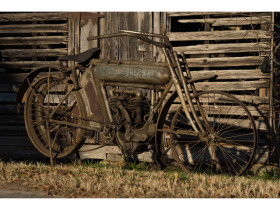 Yale Model 25 5 hp Twin Motorcycle - Superb original condition, Twin cylinder engine, belt driven - More information coming soon! 1911 Elmore Touring Car - This is a very rare 1911 Elmore Model 25 Touring car manufactured in Clyde, Ohio. General Motors owned the Elmore automobile company at this time. This car has had a complete professional restoration and received an AACA Senior Award in 2014. 1922 Oshkosh Model BB 2.5 Ton Truck - one of the earliest known of this model! 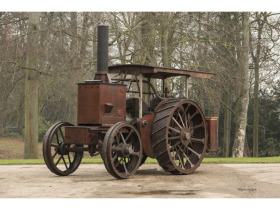 Case 12-25 - Nice western tractor, great early Case to add to your collection! Heider 12-20 C - Rock Island's first tractor since buying the Heider Tractor Co. was the 12-20 C. It was sold with a model M Waukesha four-cylinder engine, Kingston 5-ball carburetor and Dixie magneto. The transmission is a friction-drive styled using two disks, one for forward and one for reverse. This example has a unique cast iron radiator with “Rock Island” across the top. Avery 14-28 - More information coming soon! John Deere BW - This tractor is in great mechanical condition with a wide front that has an experimental part number! John Deere Unstyled B - Nice running and driving example! John Deere Nickel Hole Flywheel D - More information coming soon! Best Thirty - Very nice example that has undergone full mechanical restoration, starts, runs, and drives very well. 1912 Otto Columbian Style 5hp - Nice tank cooled example with some original factory marks still visible. International Harvester 15hp Famous - Nice original example with dual clutch pulleys and autosparker bracket. Make sure you check back often to see what gets consigned!